The mission of Sigma Alpha Epsilon is to promote the highest standards of friendship, scholarship, and service for our members based upon the ideals set forth by our Founders and as specifically enunciated in our creed, The True Gentleman. We take pride in excelling in all areas of Greek life: academics, service and philanthropy, brotherhood, social, intramural sports, and university relations. Like all chapters of Sigma Alpha Epsilon, we hold our members to the highest standards of our creed, The True Gentleman. SAE is North America’s largest social fraternity. Fraternal symbols include the lion, the phoenix, Minerva, and the fleur-de-lis. 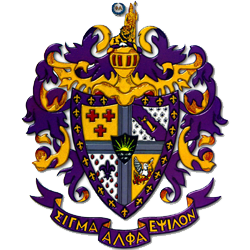 Sigma Alpha Epsilon was the first fraternity to establish a national headquarters (1929), a national Leadership School (1935), a national Men’s Health Issues Committee (1980), and a career-development program entitled the Leading Edge (1990). Currently, the Fraternity offers a comprehensive member-education program called The True Gentleman Initiative. The Fraternity communicates through The Record magazine, a quarterly publication that has been published continuously since 1880. New members receive a copy of The Phoenix for educational development. There are 226 total chapters and approximately 14,000 undergraduates. Sigma Alpha Epsilon has initiated more than 305,000 men. Nearly 25,000 collegiate brothers have graduated from our annual John O. Moseley Leadership School. TV Room with 60” Plasma and 5.1 surround sound and new leather couches.